The perfect combination of lobster, ham and rock rice infused with scallion juice makes a scrumptious dish fit for any occasion. The good news is this melt-in-your-mouth meal is rich in flavour yet so healthy you can enjoy it without the guilt. 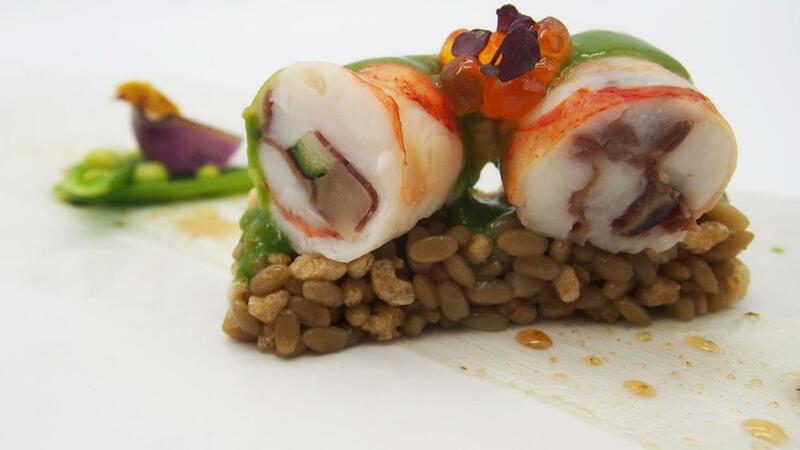 Roll the fresh lobster into the Spanish ham, Japanese cucumber and mushroom. Add Sichuan pepper oil on the surface of the lobster and cook for 18 minutes at 63 degrees with low heat. Mix in the scallion and add in chicken broth, honey rock sugar sauce, potato starch. Set aside as a sauce. Steam half of the rock rice for 18 minutes, and fry the other half till fragrant. Garnish with sweet peas, red sorrel.